No 9 Burghley Lane is a grade 11 listed town house located in the stunning stone town of Stamford, Lincolnshire and it’s only a 15 minute walk across the park to the magnificent Burghley House. The house has been designed to sleep up to 8 guests over four floors but is ideal for couples wanting to stay too and any length of stay is available. We offer flexible check in times and whenever possible let guest check out as late as they wish. The house has a well equipped kitchen and there are laundry facilities too. Travel cots and high chairs are available to on request and your dogs are welcome too. The location on Burghley Lane makes it ideal to walk into Stamford’s centre where guest can enjoy the many independent shops and great eateries on offer. There is a bathroom on the first floor and a unique wet room with W.C. and basin in the basement tunnel (kids love this feature). The house has wifi too. Please do get in touch with the owner Jane who will be happy to give you a price and availability. We can even arrange to put your food and drink away on the day of your arrival if you order on line so even you wine will be chilled on arrival and leaves you more room in the car too. The house is not suitable for guests with mobility issues but we do have cottages in the area which are designed with the less mobile in mind, please ask for details. The house has been a self-catering holiday home for several years and we have many guests who come back year after year. Many locals book the accommodation for their friends and family to stay in if they don’t have enough spare bed space in their own homes. You could say we are the areas spare bedroom. All linen and towels are included in the cost as is heating and power. There is a small courtyard to the rear of the property. The master bedroom is a double and the bunk bed room has been slept in by adults too. 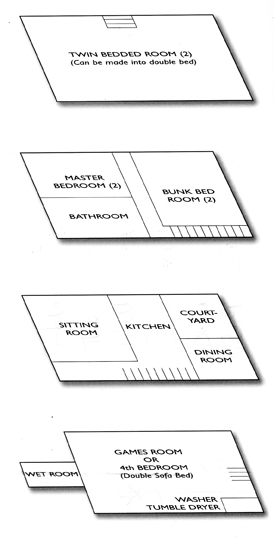 The second floor bedroom can be made up as twins or as a double. The basement room (it has a window) has a double sofa bed.